The Andkon Arcade still has t-shirts. Please read everything below before placing an order. Send an email ( ) if you have questions not answered here. Q: Which carrier ships the shirts? A: The shirts will ship through USPS (first-class mail). Q: Can you ship to outside the United States? A: No, unfortunately it's too much of a hassle to ship internationally. Q: When will shirts ship? A: Shirts will ship at most a few days after you place your order. 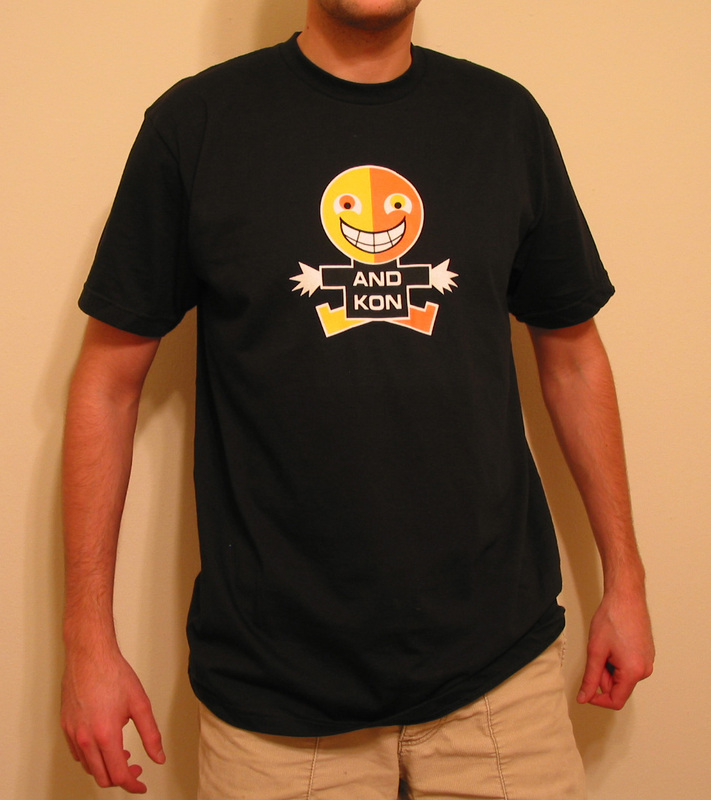 A: The black shirt's front features the Andkon Arcade logo. The back is empty. Q: I ordered but I noticed I made a mistake! A: If you want to change or add to your order, you have to cancel it and go through the cart/checkout again. You can also cancel your order entirely. You can change or cancel for free, but you have only until the shirts ship out to do either. Q: What size shirt should I get? Q: Is PayPal the only option? A: Yes, orders can only be accepted online through PayPal. You don't need to sign up for a PayPal account though. There are no refunds after the shirts ship. You will get a new shirt if you get sent a size you didn't order. If the size you ordered wasn't a good fit, you are responsible for shipping it back to exchange for a new one.